This article is about the army of British India (1895–1947). For the current army of the Republic of India, see Indian Army. For the current army of Pakistan, see Pakistan Army. The Indian Army (IA), often known since 1947 (but rarely during its existence) as the British Indian Army to distinguish it from the current Indian Army, was the principal military of the British Indian Empire before its decommissioning in 1947. It was responsible for the defence of both the British Indian Empire and the princely states, which could also have their own armies. The Indian Army was an important part of the British Empire's forces, both in India and abroad, particularly during the First World War and the Second World War. A group of Indian soldiers posing for volley firing orders. c. 1895. The officer commanding the Army of India was the Commander-in-Chief, India who reported to the civilian Governor-General of India. The title was used before the creation of a unified British Indian Army; the first holder was Major General Stringer Lawrence in 1748. By the early 1900s the Commander-in-Chief and his staff were based at GHQ India. Indian Army postings were less prestigious than British Army positions, but the pay was significantly greater so that officers could live on their salaries instead of having to have a private income. Accordingly, vacancies in the Indian Army were much sought after and generally reserved for the higher placed officer-cadets graduating from the Royal Military College, Sandhurst. British officers in the Indian Army were expected to learn to speak the Indian languages of their men, who tended to be recruited from primarily Hindi speaking areas. Prominent British Indian Army officers included Lord Roberts, Sir William Birdwood, Sir Claude Auchinleck and Sir William Slim. Recruitment was entirely voluntary; about 1.75 million men served in the First World War, many on the Western Front and 2.5 million in the Second. Non-Commissioned Officers included Company Havildar Majors equivalents to a Company Sergeant Major; Company Quartermaster Havildars, equivalents to a Company Quartermaster Sergeant; Havildars or Daffadars (Cavalry) equivalents to a Sergeant; Naik or Lance-Daffadar (Cavalry) equivalents to a British Corporal; and Lance-Naik or Acting Lance-Daffadar (Cavalry) equivalents to a Lance-Corporal. In the aftermath of the Indian Mutiny of 1857, also called the Sepoy Mutiny by the British, the three armies of the former Presidencies of the East India Company passed to the British Crown. 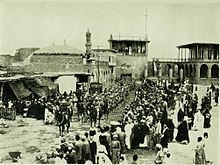 After 'the Mutiny', recruitment switched to what the British called the "martial races," particularly Sikhs, Awans, Gakhars, and other Punjabi Musulmans, Baloch, Pashtuns, Marathas, Bunts, Nairs, Rajputs, Ahirs, Kumaonis, Gurkhas, Garhwalis, Janjuas, Dogras, Jats, Gurjar, Mahars and Sainis. To emphasise that there was now only one Indian Army, and that all units were to be trained and deployed without regard for their regional origins, the regiments were renumbered into single sequences of cavalry, artillery, infantry of the line, and Gúrkha Rifles. Regimental designations were altered to remove all references to the former Presidential Armies. Where appropriate subsidiary titles recalling other identifying details were adopted. 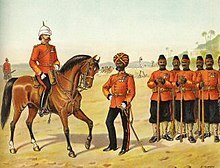 Thus the 2nd Bengal Lancers became the 2nd Lancers (Gardner's Horse). The mountain batteries had already lost their numbers two years earlier. Under the 1903 reforms they were renumbered with twenty added to their original numbers. 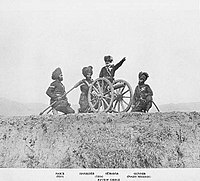 The army had very little artillery (only 12 batteries of mountain artillery), and Royal Indian Artillery batteries were attached to the divisions. The Indian Army Corps of Engineers was formed by the Group of Madras, Bengal and Bombay Sappers in their respective presidencies. Some Indian Army personnel resisted recruitment and remained POWs. An unknown number captured in Malaya and Singapore were taken to Japanese-occupied areas of New Guinea as forced labour. Many of these men suffered severe hardships and brutality, similar to that experienced by other prisoners of Japan during the Second World War. About 6,000 of them survived until they were liberated by Australian or US forces, in 1943–45. As a result of the Partition of India in 1947, the formations, units, assets, and indigenous personnel of the Indian Army were divided, with two-thirds of the assets being retained by the Union of India, and one third going to the new Dominion of Pakistan. Four Gurkha regiments (mostly recruited in Nepal, which was outside India), were transferred from the former Indian Army to the British Army, forming its Brigade of Gurkhas and departing for a new station in Malaya. British Army units stationed in India returned to the United Kingdom or were posted to other stations outside India and Pakistan. During the transition period after partition, Headquarters British Troops in India, under then Major General Lashmer Whistler, controlled the departing British units. The last British unit, 1st Battalion, Somerset Light Infantry, left on 28 February 1948. Equipment from most British units was retained by the Indian Army, as only a single infantry division, the 7th Indian Infantry Division, had been stationed in Pakistan before partition. The present-day Indian Army and Pakistan Army thus were formed from units of the pre-partition Indian Army. Both of these forces, and the Bangladesh Army which was created from the Pakistan Army on the independence of Bangladesh, retain many British Indian Army traditions. 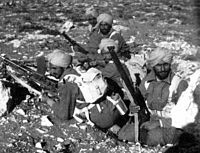 ^ "British Indian Army – A Brief History (1857–1947)". ^ "Southern Command History". Indianarmy.nic.in. Retrieved 4 January 2010. ^ Ilbert, Courtenay (1 January 1913). "British India". Journal of the Society of Comparative Legislation. 13 (2): 327–333. JSTOR 752287. ^ "Exhibitions & Learning online | First World War | Service records". The National Archives. Retrieved 20 November 2012. ^ Barua, Pradeep (2003). The Gentlemen of the Raj. Westport, CT: Praeger Publishing. ^ Barkawi 2006, p. 341. ^ Smyth, Sir John (1967). Bolo Whistler: the life of General Sir Lashmer Whistler: a study in leadership. London: Muller. pp. 170–184. OCLC 59031387. Barkawi, Tarak (April 2006). "Culture and Combat in the Colonies: The Indian Army In the Second World War". Journal of Contemporary History. Sage. 41 (2): 325–355. doi:10.1177/0022009406062071. Imperial Gazetteer of India, Volume IV (1908). Indian Empire: Administrative. Oxford: Clarendon Press. p. 552. Collen, Edwin H. H. (1905). "The Indian Army" . The Empire and the century. London: John Murray. pp. 663–81. Jackson, Major Donovan. India's Army. Sampson Low. London c. 1940. McCosh, John (1856). Advice to Officers in India (revised ed.). London: Wm. H. Allen & Co.